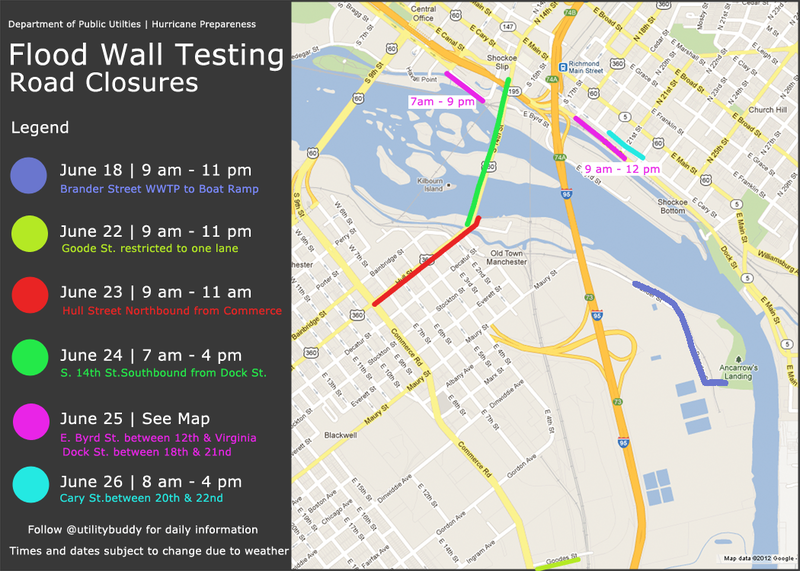 Beginning Monday, June 18 through Tuesday, June 26, 2012 at various times each day (schedule below) and weather permitting, the City of Richmond Department of Public Utilities will be performing its annual floodwall testing. During the testing at the Mayo Bridge, the bridge will be closed to all forms of traffic including motorists, bicyclists and pedestrians. 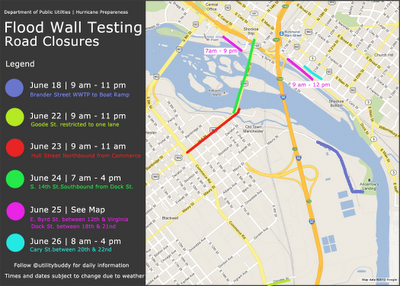 While floodwall testing is taking place, motorists will be detoured to adjoining streets. Barricades and signs will be posted to alert motorists. The City of Richmond Department of Public Utilities (DPU) is a premier provider of utility service. DPU provides natural gas, water, wastewater and storm water utility services to more than 500,000 residential and commercial customers in the metropolitan region. In addition, DPU operates an electric street lighting utility, which maintains 37,000 streetlights throughout the City. For more information, visit DPU's Web site at www.richmondgov.com/dpu. Mayor Dwight C. Jones and Richmond City Council Vice President Ellen Robertson presented Love Your Block mini-grants to several neighborhood groups on Tuesday, June 12 at 11 a.m. in the City Hall 2nd floor large conference room at 900 East Broad Street. In January 2012, the City of Richmond’s Neighbor-To-Neighbor (N2N) Initiative was awarded a $10,000 grant from Service Nation, in partnership with the Home Depot Foundation, in the form of Home-Depot gift cards toward the implementation of a Love Your Block (LYB) program. By way of the LYB grant, the City will provide competitive mini-grants, in the form of a $500 Home Depot Gift Card, to neighborhood groups to purchase the supplies needed for their local project. Community groups may also coordinate with City Departments for services (as available) to support the effort. LYB grants encourage community groups to identify priority projects and develop volunteer-fueled solutions to: 1) Improve resident perception of safety, with improved lighting, landscaping, etc., 2) Reduce crime incidents and other gang/drug related vandalism with graffiti removal, and community garden initiatives, 3) Reduce trash through street clean-ups/increase recycling. 1) City recreation centers should be equipped with Wi-Fi hot spots where internet is accessible. With this improvement youth will be able to connect their laptops, iPads, and smart phone devices to the internet. 2) City public libraries should designate ten to fifteen computers with limitless time for research projects, research papers, filling out job applications, college admittance applications, and financial aid. 3) Richmond Public Schools should assign employees to come before and after school to allow students extended time to work on school related activities and assignments. The Mayor’s Youth Academy Future Leaders Council is an out-of-school-time program that promotes leadership, civic engagement, and higher education. The program provides youth with various leadership opportunities through interaction with government officials, participation in workshops and seminars, and taking part in civic engagement and community service events. The program consists of 24 youth from 14 to 19 years of age. The Mayor’s Youth Academy Future Leaders Council officers were elected to their positions by their peers to mirror those of Richmond City Government. The 2012 program officers include a Youth Mayor, Council President, Council Vice President, Council Clerk, Council Chief Administrative Officer, and nine Youth District Representatives.